Are your looking for an experienced company to build your work boat or barge, then the crew at Giddings Boat Works is the right choice. Located in the Charleston Harbor on the Southern Oregon Coast the team at GBW has an excellent reputation as a Custom Barge Builder. 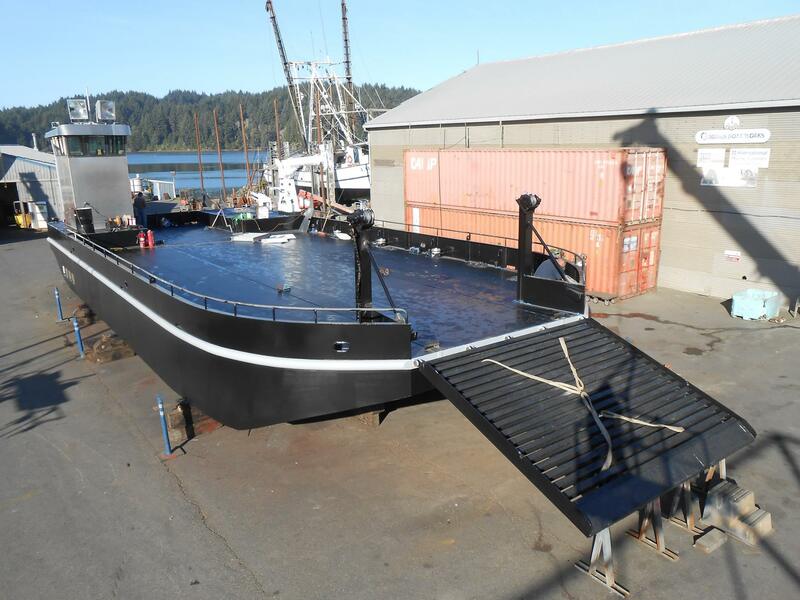 Working with local companies on the Oregon Coast such as Pacific Seafood, Giddings Boat Works has constructed several Aquaculture Barges for their operations. These barges are now serving the steelhead farms the company operates on the Columbia River in NE Washington. The outer hulls would both contain a complete propulsion system in the stern compartment, consisting of a Tier 2 Cummins 300 hp QSL-9 diesel, with ZF 325-1 reduction gear, 3” shaft and 40” diameter prop, and rudder. The aluminum wheelhouse was built by Tarheel Aluminum—Cox’s original marine business, founded in 1999 and located on the same waterfront lot as Giddings Boat Works , the company is now owned and operated by Ray’s son Kyle Cox. So far Giddings Boat Works has built 3 barges for Pacific Aquaculture, the first being a smaller aluminum hull 32′ X 16′ , the second 60′ X 20′. These Custom Barge projects have shown that the GBW team can build a high quality vessel at short notice… and deliver it anywhere highway rules allow ! More recently the team here at GBW completed a Pacific Coast Oyster Barge that was launched and sailed to Washington where it will be put into service. Give us a call today at 541-888-4712 or Contact Us online and let us know what type of Custom Barge Construction your looking for.